Do you wish you could have that magazine-like layout? Or maybe you would like to create unique sponsored posts that will wow your readers? Setka Editor can make your most elaborate content dreams come true. Every blog can be a new experiment with the form. No coding skills necessary. Easily add a level of interactivity and increase the time readers spend with your content. Add animation, anchors or full width and background images on the fly to make your posts more engaging. 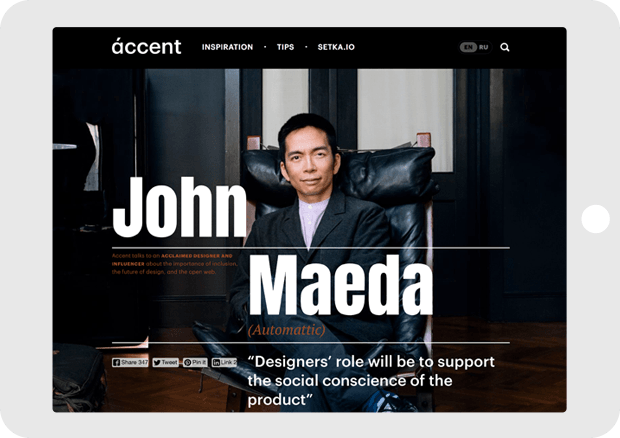 Structure your content, dramatically improve readability and gain perfect control over every element on your page in just a few seconds with the grid system. Choose from hundreds of Google Fonts, connect your Adobe TypeKit or upload your own fonts. Around 53% of visitors to an article will leave before reaching 15 seconds of engagement on the page. When pressed for time, 59% of global consumers crave beautiful design over simplicity. 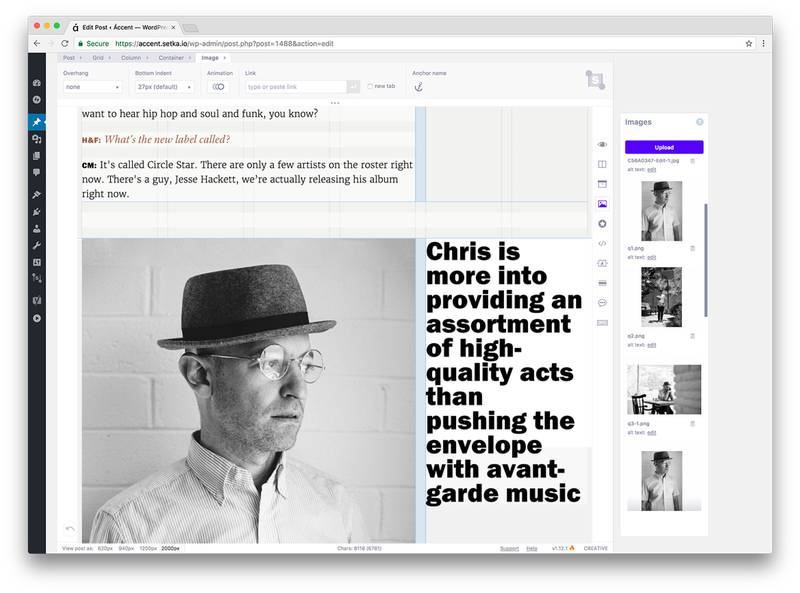 Want to stop messing around with CSS and HTML or wasting hours on designing daily posts from scratch every time with page builders? We get it. Setka Editor will help you save time and focus on the creative tasks. With Setka Editor you can save your most used elements as snippets and re-use them at a click of a button. Define your header formats, fonts, colors, dividers and icons to create your own in our Style Manager. We also have 5 amazing pre-made styles to satisfy any taste. Smart Design Tools use algorithms to analyze patterns and different content elements to make layout recommendations. — It’s everything and more I’ve ever dreamt about as a creator of content. At a reasonable price you can suddenly compete with magazines that built their websites with venture capital. I love it! You will never have to worry about being mobile-friendly again. Setka Editor automatically adapts your post design for mobile and autoscales images. If you would like to further customize it, you can set specific text formats and fonts for desktop, tablet and mobile. Preview your post instantly to see what they would look like on different devices. 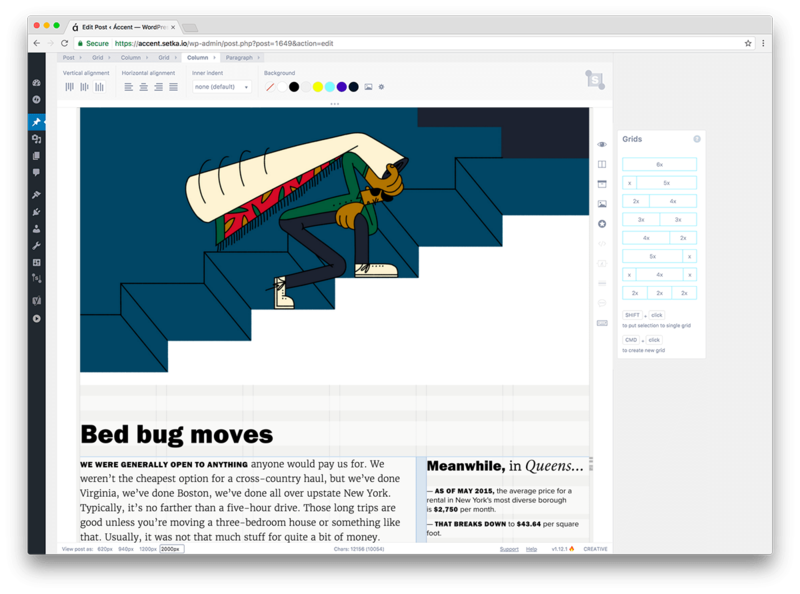 — Setka Editor is a WordPress content editor that offers one of the quickest ways to create beautifully designed content that I’ve encountered. Feel confident and at ease, knowing that we got you covered. Setka Editor was developed for publishers by publishers. We know what problems and frustrations are associated with designing outstanding content on a daily basis. That’s why we are adding new amazing features every month. Setka Editor is beautiful inside out – we made sure our code is squeaky clean. We tested Setka Editor while working on special projects with over 900 international brands.